Congratulations to "Trish J. ", the winner of Caitlyn's giveaway. Thank you to all who participated! Alex is not a girly-girl, she spends her days racing Formula 1 cars, fulfilling her father’s dreams and making waves in the English F1 circuit. Alex faces an endless battle to be taken seriously in a man’s world. Just when it seems she’s going to have to give up everything she’s worked so hard for, Rob Dryden, reluctant owner of an F1 team announces he’s looking for a female driver. Hamish MacCameron does not like Rob Dryden, in fact he’ll do anything in his power to destroy him. If revenge on the Drydens includes blackmailing the lovely Alex into his bed, so much the better. When MacCameron ends up dead, Rob and Alex are top suspects on the list. All the secrets and lies come out and Alex ends up as the star of a viral You Tube video, and not in a good way. Drive Me To Distraction is my third full-length novel, and is available from 1 November 2012 in e-book format. 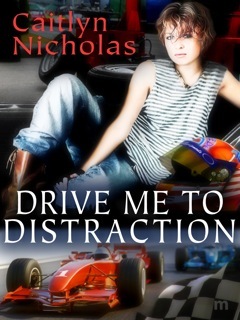 I will be giving away a digital copy of Drive Me To Distraction to one lucky reader leaving a comment. Giveaway ends 11:59pm EST Nov. 7th. Please supply your email in the post. You may use spaces or full text for security. (ex. jsmith at gmail dot com) If you do not wish to supply your email, or have trouble posting, please email maureen@justromanticsuspense.com with a subject title of JRS GIVEAWAY to be entered in the current giveaway. It is totally fun to read about a Protagonist like this Caitlyn. I bet it was fun to write too! My complete pleasure :) Thanks Colleen! A woman breaking into a man's world: Racing. Poor Alex. She is stuck between a rock and a hard place. I would love to find out what happens to Alex. Formula 1 is not a world I know anything about. Good thing I like to learn. There is certainly a lot of excitement in DRIVE ME TO DISTRACTION. Women can do everything!! I completely agree, they CAN do everything :) Thanks Mary! I saw the link to this blog on Twitter and and so glad I took a peek. Not only do I love romantic-suspense, but strong, self-reliant heroines are my favourite. I ride a motorbike, so am sure I'll connect well with rev-head Alex. Best of luck with book sales Caitlyn! I would imagine that there are a number of people who hated Hamish. It will be interesting to see who did him in.